Bangalore: E-governance, or reaching people through technology, has been coming of age in India for several years. Providing sustainable urban services in the country’s burgeoning cities in an efficient, reliable, transparent and integrated manner is no easy task; and it’s only now that some of these initiatives are becoming popular. Many cities such as Bangalore, Hyderabad and Rajkot have started delivering citizen services electronically that vary in size and scope, most of them begun in the past couple of years. Rajkot municipality offers information and tracking services via text messages on taxes, water bills, birth and death registrations, property-related issues and so on. Hyderabad city authorities keep track of various civic activities from a remote location through cameras and GPS-equipped mobile phones. Perhaps fittingly, Bangalore, the country’s information technology capital, has been providing integrated citizen services since April 2005 through a now popular initiative called BangaloreOne (B1). B1 has established a network of 75 centres across the city that serve as one-stop shops for residents to pay municipal taxes and water, electricity and phone bills, register property, book train and plane tickets, transfer money, pay traffic fines, and use varsity and board examination services such as revaluation. The number is soon set to touch 100. In a country where coordinated work by various government departments is virtually absent, B1 has succeeded in providing at least 40 services of 20 government departments and several from private firms such as wireless operators, starting with 13 services of 10 departments six years ago. A study has shown that nearly 38% of the people visit B1 centres in the evening, according to H.S. Kumudavally, assistant director, directorate of electronic delivery of citizen services. 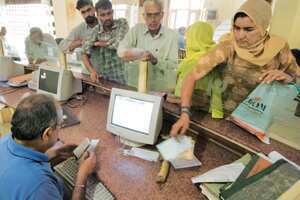 “Earlier, people had to take time off from work to avail various government-to-citizen services. They had to visit various offices and private outlets for availing services," Kumudavally said. “With the implementation of BangaloreOne, a majority of the crucial services are being offered under a single roof." The project is run by the Karnataka government in partnership with various private firms that include CMS Computers Ltd and RAM Informatics Ltd.
To set up the centres, the government provides furnished space while a private partner invests in connectivity, computers and accessories, and bears operational costs. Since the government and utilities provide rent-free space, Kumudavally said, “The government spends only on the interiors of the centres." More than 1.2 million are using the services at the B1 centres, which have completed more than 40 million transactions worth ₹ 3,050 crore since inception till the year ended March, according to Kumudavally. The average distance to a B1 centre is less than 2km in many parts of the city, and the average waiting time to transact business is less than 15 minutes, said Kumudavally, adding that the facility is being extended to the outskirts of Bangalore that are being added to the city corporation. “The plan for expansion is to immediately roll out additional centres to reach 100 at the earliest," he said. The gamut of services at the B1 centres is also available over the Internet. Encouraged by the popularity of the initiative, the state government has started another scheme that aims to provide similar services in smaller cities. The facility has been extended to nine cities in the state in varying degrees.